Our first stop at the Imagitoons Zoo mammal exhibit is this wonderful girothum (jur-oth-um). Girothum live in a large group which allows there to always be members watching for danger. In the even that the group is threatened, the male girothums call out in a low to high pitch grunt in an attempt to scare away the threat. Most of the time, however, girothums just wander around eating from bushes and shrubery. 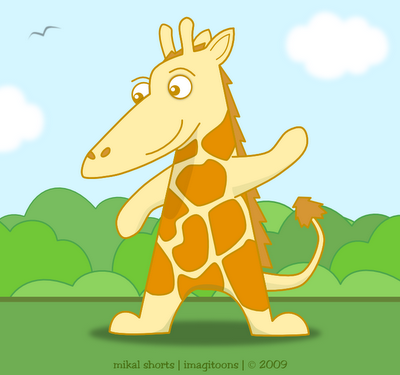 They have been known to live in amongst giraffes and even fought with the giraffes victoriously against the ostriches. We'll let this fisty little guy be - let's move along, kiddos! Have you missed any Imagitoons Zoo creatures? Keep up HERE!